It looks fancy and compact in size.Very handy to use. It measures 2 ~ 9 blades prop rpm. It shows 4 digits in a 0 ~ 99,999 rpm range.Multiply the readout by 10 for final rpm reading. It comes with a replaceable 3V LITHIUM battery. There is an auto shut-off function after five minutes when no signal received. When the LOW BATTERY icon is on,the battery needs to be replaced. It needs a little electronic power (0.02mA) when the tachometer is not in use.This depends on battery's capacity for life of battery. 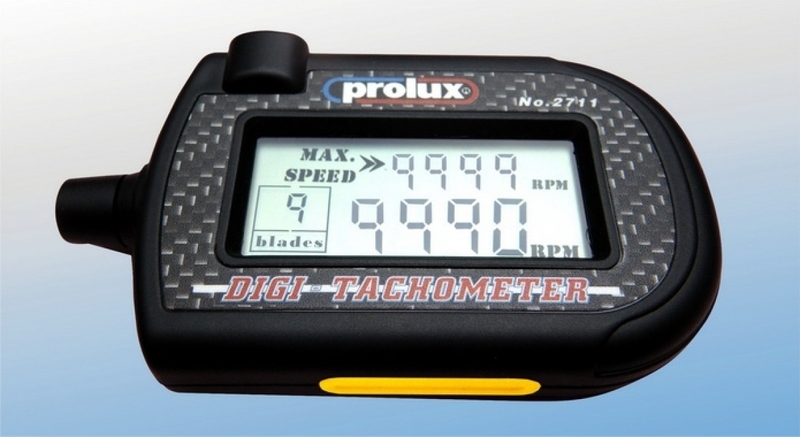 Display and memorize the maximum rpm value.